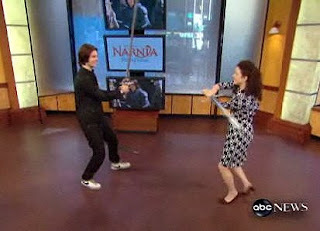 Did you see Good Morning America's Entertainment correspondent Taryn Winter Brill (C'00) battle it out with The Chronicles of Narnia: Prince Caspian's Ben Barnes the other day? She seemed to be pretty into it! More of my posts on our alumni "news" talent! Trying To Study? : Don't Watch This!